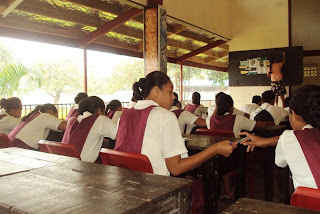 Last week a bunch of students from the National University of Samoa started showing up at my school to shadow teachers and student-teach. One has been assigned to me, which is cool except for I find the whole thing to be a farce. I have no business mentoring an education major. I barely know what I’m doing, and if I choose to teach in The States when I go back, I’ll have to go through a year-long credentialing program during which I would have to be a student-teacher. That said, watching my shadow in front of the class, I can definitely teach her a lesson or two. Naomi was assigned to shadow me because she has an emphasis in computer studies. Her other emphasis is in PE, and my school is between PE teachers right now. She is young and ambitious and the world is still her oyster, and theory-wise, her background in education is probably far stronger than mine. But alas, classroom management is not something you can learn in a theory class. It makes sense the NUS kids are showing up now since they are nearing the end of the university’s scholastic calendar and they’re putting what they’ve learned into practice. 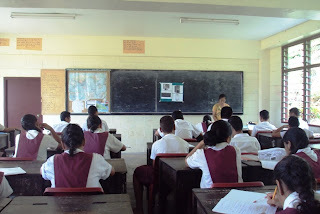 The problem is we are also nearing the end of the school year, and we’re reviewing for exams now. There isn’t much “teaching” going on here. Peace Corps runs into the same problem when trainees spend 2 days with an actual volunteer during training to get a glimpse of what life is like. When I visited Sara last year, her lesson plan involved going over the answers to a practice test. This lack of new curriculum got stickier yesterday when, after two weeks of being here, Naomi told me she needs to teach ten lessons before the end of her 4-week stay. “Ten periods?” I asked. Ouch. I see my year 9s and 10s once a week, so Monday through Friday, I teach the same lesson day in and day out. My life is like a slightly more sophisticated Samoan version of Blue’s Clues. My year 12s and 13s are the ones that function like a traditional daily class with five different lessons each week; however, those classes aren’t in session this week because they’re taking year-end exams. So keeping my classes on the same page and having Naomi teach 10 lessons is going to be tricky. The other problem is sacrificing control. The year 9s, 10s, and 11s have their year-end exams coming up as well, and I’d like to be helping them cram right now. Proofreading the year 9 test, I saw the test asks about motherboards and processors, and my kids know none of that. I feel some urgency in communicating these concepts, and my style is a little cramped with the student teacher and all. It could be a good thing though. I need to utilize her Samoan fluency to better communicate to my kids. And the students can only benefit from receiving the same information from someone else. A rising tide lifts all boats, and hopefully my kids and Naomi can both benefit from the situation. Naomi leading the 9.2 class. I made the poor girl teach the 9.4 class, who are currently holding classes in the Great Hall because they've been displaced from their classroom by the earthquake. Also during this particular class it was pouring rain. Heard about your great Power point presentation at the FiaFia...how do you find the time to do such wonderments so routinely? haha Naomi, that's my cousin. I hope you got her to go the shop and get her your lunch Matt! 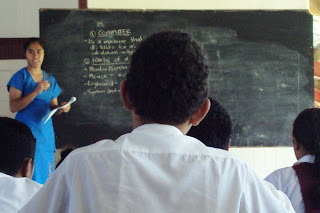 That's a skill all samoan teachers need hehe. Thanks for your patience.